Acca sellowiana, formerly known as Feijoa sellowiana. Native to South America, Pineapple guava produces green, egg-shaped fruit in late summer on an evergreen, large shrub that can reach 20 feet but is amenable to almost any amount of pruning or shaping. The leaves are silver beneath and green above and billow like a linden tree in the wind. They create a perfect foil for the amazing flowers, with their big blowsy stamens that are visible from a great distance. They look like myrtle flowers on steroids, and no wonder. Pineapple guava is a member of the myrtle family. Birds and bees are drawn to those flowers and birds will eat the petals, pollinating the flowers as they feast. Some claim the petals are edible for humans, but this is a stretch for most palates. Pineapple guava grows best in areas with summer temperatures below 90 degrees and winter temperatures above 15 degrees. Temperatures below 15 degrees for sustained periods will kill the shrub. No pests or diseases of any note plague this easy-going species. Self-fertile, but a larger crop with 2 or more plants, or hand pollination. Drought tolerant and can survive Mediterranean summers without any supplemental irrigation, yet can take regular watering. Full sun in cool summer areas, benefits from filtered sun in warmer climates. The fall fruit is filled with soft, tropical tasting pulp that is scooped out like an avocado. The taste falls somewhere between a banana, a pineapple, a kiwi and a guava. Fruit drops from shrub when ripe. Fruit grown in cooler summer areas has better flavor than crops from desert locations. Numerous named cultivars exist and they will fruit at a younger age than seedlings. Shipping 35% to CA, 40% to OR,WA,AZ and NV, and 45% to rest of continental U.S.
Feijoa sellowiana. Pineapple guava might be the easiest and most rewarding of subtropical shrubs to grow. This is the straight species, blooming in spring and fruiting in fall. Plant two shrubs for optimal fruit set. As of August 2018, plants are about 2.5' tall. Grown in 1 gal containers. Feijoa sellowiana 'Apollo.' This is one of our favorite late season pineapple guavas, with deep pineapple flavor. Great for throwing in the blender batch of Pina Coladas if you don't have any pineapple in the kitchen. A vigorous, productive and self-fertile cultivar, will pollenize most other varieties. Fruit is large and thin-skinned, so treat gently or these fruits will bruise. As of October 2018, plants are about 2.5' tall, branching. 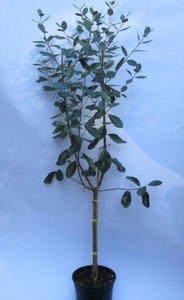 These are cuttings, not grafts, so no need to remove ground-level growth. Grown in 1 gal containers. OUT OF STOCK UNTIL FALL 2019. Feijoi sellowiana 'Nikita.' Large fruit on a compact bush defines a superior terrace specimen and here it is. As the name implies, this cultivar hails from the Ukraine, where it obtained its early fruiting habit. Partially self-fertile but will bear more prolifically with another variety nearby. 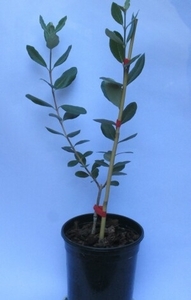 As of August 2018, plants are well-branched, narrow caliper, about 2' tall. Grown in 1 gal containers. OUT OF STOCK UNTIL 2019. Feijoi sellowiana 'Coolidge.' The most reliable pineapple guava cultivar,'Coolidge' sets an abundant early harvest of 4" x 2" oval fruit in the fall for a long period. Self-fertile. As of October 2018 plants are much smaller than photo, about 2' tall, branching just beginning. Grown from cuttings. 'Robert' is a New Zealand cultivar that offers plentiful, large fruit on a compact bush. Probably one of the most reliably self-fertile cultivars. Grown in 2 gal containers, plants as of May 2018 are 4' tall, 5/8" caliper trunk, have been pruned back to promote branching. OUT OF STOCK. Feijoa sellowiana 'Mammoth.' This cultivar has the largest (up to half a pound or more) and tastiest fruit of all the Pineapple guavas, a rare combination in the fruit world. The pulp contains a strong guava flavor with strawberry undertones. Matures earlier than the species, with fruit often ripening by September. Grown in 1 gal containers, trees as of October 2018 are much smaller than photo, about 8" tall, no branching, very narrow caliper, no older wood. Grafted, so remove growth below graft.